Is it possible to be modern and Bhutanese? Discussions om the relationship between modernity and tradition seem limited to the worry that Bhutanese today have no real identity and are caught between the past and present, what Dr Karma Phuntsho calls the ‘diachronic conundrum’1. A deep discussion in Bhutan already exists about how to preserve national identity, but comparatively little public conversation has been devoted to what it might mean to be Bhutanese and modern. Preservation, of course, is vitally important. However, focusing too much on preservation risks presenting a false dichotomy between tradition and modernity, and risks dismissing the creative work of Bhutanese who engage with a changing society while staying true to their roots. Contemporary art, I want to show, offers a counter-point to a preservation approach. Contemporary artists are already finding creative ways to reinterpret their identity, ways of being Bhutanese and modern. What I call ‘the preservation approach’ to identity unites what scholars call ‘primordialism’ to a story about the risk of completely losing Bhutanese culture. Primordialism refers to a way of thinking about national identity as something homogeneous, timeless, and as a unique essence shared by all members of a group. Bhutanese primordialism often finds its clearest expression when juxtaposed to ‘Western’ culture. Karma Phuntsho’s History of Bhutan, to take an example, credits rising consumerism and exploitation of nature in Bhutan to the secular mindset learned in modern, Western-style education. In contrast, Bhutanese approaches to nature, according to Karma Phuntsho, rely on an appreciation for the sacred quality of nature and respect for all sentient beings.2 The theme is repeated across a wide variety of policy and scholarship: Bhutan is communal, the west individualistic; Bhutan is spiritual, the west materialistic; Bhutan is Buddhist, the West Christian; Bhutan is a society based on respect and harmony, the West rebellion, conflict, and exploitation. Despite its importance, the emphasis on preservation creates the impression that attempts to edit or reinterpret tradition to respond to a changing world are unauthentic. The zorig chusum, for example, form a central component of how Gross National Happiness is assessed, while newer art forms do not.3 Likewise, rigsar, Bhutanese film, and even television have been dismissed for appealing to the ‘lowest common denominator’ or not being sufficiently Bhutanese.4 These assessments come despite the fact that Dzongkha films contribute positively to the preservation of language and show the promise of developing uniquely Bhutanese narrative elements.5 Whatever opinion one may hold about the shortcomings of new forms of cultural production in Bhutan, they frequently engage with contemporary realities from a Bhutanese perspective. They also offer a more flexible notion of tradition that treats culture as something that must speak to its historical moment and to which everyone can contribute. Contemporary art offers an alternative to the preservation approach to national identity. Especially at the Voluntary Artists’ Studio Thimphu, known as ‘VAST’, a civil society organization that pushes against conventional wisdom even as it reaffirms Bhutanese identity. Although there were earlier experiments with foreign styles of painting, contemporary art really took root in Bhutan with the founding of VAST in 1998. The institutional culture at VAST incorporates many of the touchstones of global modernity: egalitarianism, meritocracy, and individualism. Many of the artists I spoke to felt that hard work and talent were what counted at VAST, that anyone with a good idea and initiative could contribute to VAST’s projects, and that VAST helped them cultivate their own individual point of view. The sheer variety of styles that have come out of VAST are a testament to the emphasis on finding a personal aesthetic. However, VAST and its members are in very meaningful ways traditional. Cutting against the idea of the artist as a lone, creative genius, members of VAST repeatedly told me during my fieldwork having a community was essential to their development as artists. Likewise, Kama Wangdi, affectionately known as Asha, admonished students not to become arrogant simply because, unlike thangka painters, they signed their name on their artwork. Beyond this, VAST sees itself as part of the community. Since 1998 VAST has run public service activities: from the public ‘Art Park’ they are making across the street from VAST’s gallery in Chubachu to yearly winter art camps to using money earned from recycling plastic bottles to rebuild chortens. VAST and its members encourage both individual expression and the very Bhutanese idea that the individual is part of a community. Contemporary artists may not always look traditional, but, as Asha put it to me one afternoon, they wear their gho on the inside. Like much of the other artwork at VAST, Asha’s paintings perform a similar tightrope-walk between modernity and tradition. The work included here I think shows a dynamic working out of Asha’s own perspectives on his past, spirituality, and in particular of his training in traditional arts. 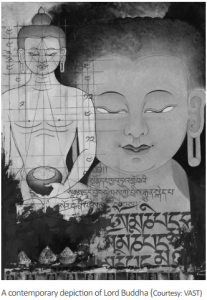 At the upper left he exposes the geometric scaffolding used to create Buddha images and overlaps it with text at the centre stating the Buddha measures four finger-widths below the waist.6 The piece is playful: Asha draws attention to the strict rules of thangka painting even as he breaks the rules. However, the work is also devout. By placing the image of the geometric scaffolding and text in front of the completed visage of Shakyamuni Buddha, Asha prioritizes the meaning behind religious images. Pairing instructions about how to paint with ‘Om Mani Padme Hum’ spatially also seems to equate them, the act of making and the act of prayer become one. Asha’s work is simultaneously individual and steeped in tradition. About Author: Jason Hopper is a PhD candidate from the University of WisconsinMadison. He first came to Bhutan in 2005 and most recently had the privilege to work as a Lecturer in Sociology and Political Science at Royal Thimphu College from 2013-2014. His dissertation research on Bhutanese art explores the issues of identity and globalisation. 1Karma Phuntsho (2013) The History of Bhutan (Kindle Location 13080). 2 Karma Phuntsho (2013) The History of Bhutan (Kindle Locations 13091-13104). 4 For remarks on rigsar see Sonam Kinga (2001) “The Attributes and Values of Folk and Popular Songs” Journal for Bhutan Studies; for “lowest common denominator” see Kinley Dorji and Siok Sian Pek Dorji (2005) “The Bhutanese Media: In the Service of the Public” Proceedings of the Second Conference on GNH; for the perceived negative influences of media in general and television in particular see Kinley Rinchen (2007) “Media and Public Culture: Media Whitewashing” Media and Public Culture : Proceedings of the Second International Seminar On Bhutan Studies. 5 See for example Tshewang Dendup (2007) “Roar of the Thunder Dragon: The Bhutanese audio-visual industry and the shaping and representation of contemporary culture” Media and Public Culture : Proceedings of the Second International Seminar On Bhutan Studies, and also Sue Clayton’s (2007) “Film-making in Bhutan : The view from Shangri-La” New Cinemas: Journal of Contemporary Film. 6 In Dzongkha the text reads (Wylie transliteration): sngon dang khyab ‘gro ba’i srgas dang byang sems kyi bris rgyun sked pa sor bzhi las med stabs. Thank you to Rinzin Dema for helping translate this.